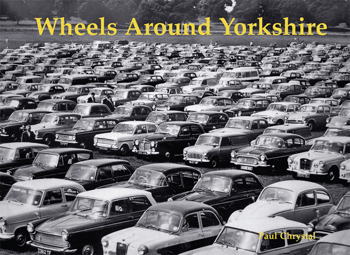 Wheels Around Yorkshire is a great collection of old photographs featuring, alas, wheels – pretty well every type except a rotary club and a wheel of fortune. Cars, trams, trains, buses are the obvious ones, but also here are a Dalek (roaming York on extermination duties), horses and carts, a paddle steamer, road roller, lorries, vans, giant spindles of cable, etc. etc. and our favourite a photo of Paul Rodgers of Free on the back of a 1954 Ford Consul. Not a serious road transport book but just a fun collection of old transport photos and unlike many such books you never know what will be on the next page.